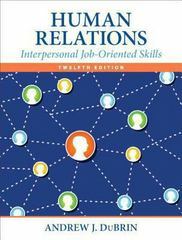 Human Relations 12 Edition For undergraduate courses in Human Relations, Applied Psychology, Human Relations in the Workplace, Career Development; also appropriate for a course in Interpersonal Skills Training. Accomplished author and national speaker, Andrew J. DuBrin brings his expertise of Human Relations and Business Psychology to this exciting Twelfth edition. Focusing on today’s work environment, the book takes a two-pronged approach that improves interpersonal skills by first presenting basic concepts and then by featuring a heavy component of skill development and self-assessment. Human Relations: Job-Oriented Skills 12e is not just a textbook. The twelfth edition includes a wealth of experiential exercises, including new cases and self-assessment quizzes that can be completed in class or as homework. This program will provide a better teaching and learning experience–for you and your students. Here’s how: Relate Concepts to What’s Happening Today, Personally and in the Workplace: Give students hands-on ways to develop practical human relations skills and stay involved in class. Reinforce Concepts and Build Skills: Proven pedagogy, exercise sets, and end—of-chapter material are all geared towards ensuring students grasp the concepts. Keep your Course Current and Relevant: New examples, research findings, and examples appear throughout the text. Twelve of the case openers and twenty-four cases are new.